At this point, it should go without saying that a number of changes are needed if we, as a nation, are going to recover from the opioid crisis in America. The problem we face is not only unprecedented, it is an epidemic that many Americans had a hand in creating—and we are not referring to the people who are addicted to the deadly drugs. People with substance use disorder (SUD) have been present in the U.S. for centuries, and people will continue to have these in the future; that being said, the rates of addiction could be mitigated by a paradigm shift regarding both addiction and the prescribing of addictive narcotics. At this point, most addiction experts agree with the idea that primary care physicians had a major role in the creation of an epidemic affecting Americans from all walks of life. Years of widespread overprescribing and a failure to adequately train doctors to identify people with opioid use disorder, has resulted in loss of life at staggering levels. What’s more, many doctors are opposed to specific addiction training and mandates which tell them how or when to prescribe opioid painkillers. Without prescribing mandates and addiction training, doctors will continue to be in a position where there are literally playing with patients' lives. 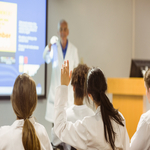 While many are against change, there are some medical schools that see the value of addiction training, recognizing it as a vital tool necessary for combating the epidemic. After concerns were raised at Stanford University School of Medicine about little emphasis being given to addiction training, the institution is increasing the focus on addiction, NPR reports. Future doctors will have classes on addiction medicine, and the training will continue even after the students begin clinical rotations. "We're at the very bottom of a very long uphill road," said Dr. Anna Lembke, the director of Stanford’s addiction medicine fellowship. Lembke was responsible for the changes being made at Stanford University. Doctors who are trained to spot drug seeking behavior or the signs of somebody having an opioid use disorder, are in a unique position to help people get the treatment they need. Or, at the very least, no longer contribute to a problem that can have a deadly outcome. If you or a loved one is abusing prescription opioids and/or heroin, please contact Hope by The Sea. We can help you break free from the drugs and help you get on the road of addiction recovery.